Step 1Heat 2 tbs oil in a large saucepan over medium heat. Add onion, garlic, chorizo, carrot and zest. Cook for 10 minutes, stirring occasionally, until vegetables soften and chorizo starts to crisp. Add stock, tomato and rice, bring to the boil, then reduce heat to low and simmer for 15 minutes until the rice is al dente. Step 2Meanwhile, heat remaining 1 tablespoon oil in a large frypan over high heat. Season the seafood, then cook, in batches if necessary, for 1 minute until just opaque. Stir the seafood into the soup and simmer for a further minute until heated through. Ladle into bowls, then scatter with parsley and egg, if desired. Wash the pear and cut into quarters. Remove the core but do not peel (the skin adds texture and color to the dish). Cut each quarter into 6 to 10 irregular, lengthwise strips, and place, roughly overlapping the pieces, onto small salad plates. Next, layer on the boquerones in a crosshatched pattern. Lay 2 or 3 boquerones parallel to each other on top of the pear. On top, in a perpendicular direction, place, parallel to each other, 2 or 3 more fillets. Shave the cheese into wispy curls — it should be as if falling from the sky — over the boquerones. With a small spoon, drizzle some of the reserved white wine vinegar around the edge of the plates. Preheat the oven to 170°C. Lightly grease six 3/4-cup (185ml) ramekins. Place the sugar in a saucepan with 1/4 cup (60ml) water and stir over low heat until dissolved. Allow to simmer for 10-15 minutes or until mixture turns golden brown, then immediately pour into prepared moulds and swirl each one so the caramel coats the sides. Leave to cool. 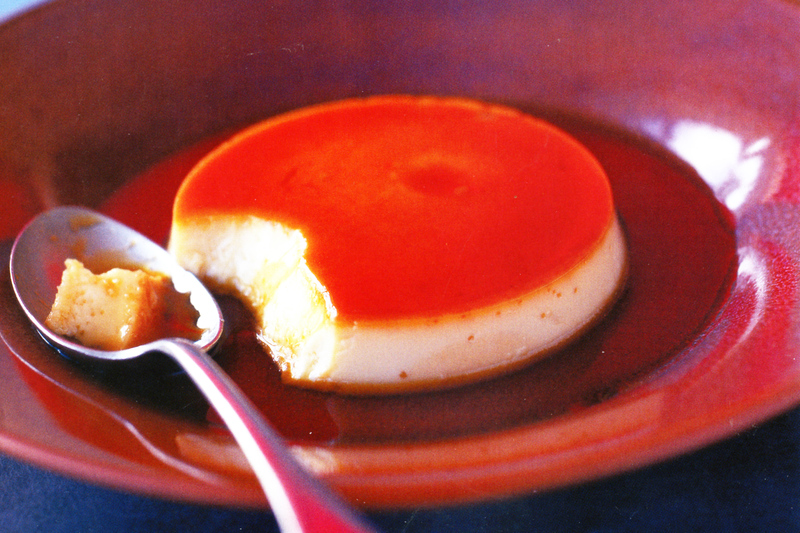 In a separate bowl, gently whisk together condensed milk, vanilla and eggs. Strain into a lipped jug. Just before serving, dip base of each mould in a bowl of warm water for about 30 seconds, then remove. Run a knife around edge of the moulds to release, then invert into shallow bowls, allowing caramel to run around edge. Serve with some thin cream, if desired. Wherever and however you buy the squid, they need to be cleaned before cooking. The spines, ink sacks and heads should be discarded. If you are cleaning the squid yourself, don’t throw away the tentacles because those are good to eat, too! Cleaned, frozen squid bodies may also be available and are good to make large calamar rings. Once the squid is cleaned, dry them thoroughly. Cut the squid bodies into rings. Pour a half-inch of olive oil into a large open frying pan and put on high heat for frying, but be careful that the oil does not smoke. Place a couple handfuls of flour and a bit of salt into a large plastic bag. Place a few pieces into the bag and shake to cover with flour. Remove the rings one at a time with your hands and carefully place in the hot oil. Continue to cover pieces in flour and add to the pan. Leave enough room in the pan to turn over pieces if necessary. Fry until the rings turn golden. When done, remove from pan and allow to drain on a paper towel. Serve hot with lemon! In a saucepan, combine the shrimp with water to cover and bring to a boil over high heat. As soon as the water starts to boil, quickly lift out the shrimp with a slotted spoon and set aside. Scoop out 1 cup of the cooking water and let cool. Discard the remaining water. When the shrimp are cool, cover and refrigerate until needed. To make the batter, combine the flour, parsley, scallions and pimentÃ³n in a bowl or a food processor. Add a pinch of salt and the cooled cooking water. Mix or process well until you obtain a texture slightly thicker than a pancake batter. Cover and refrigerate for 1 hour. Remove the shrimp from the refrigerator and mince finely. The pieces should be the size of coffee grounds. Remove the batter from the refrigerator, add the shrimp, and mix well. Pour the olive oil to a depth of about 1 inch into a heavy sautÃ© pan and heat over high heat until it is almost smoking. Add 1 tablespoon of the batter to the oil for each fritter and, using the back of the spoon, immediately flatten the batter into a round 3 1/2 inches in diameter. Do not crowd the pan. Fry, turning once, for about 1 minute on each side, or until the fritters are golden and very crisp with what Spanish cooks call puntillas, or lacelike formations, on the borders. Using a slotted spoon, lift out the fritters, holding them briefly over the pan to allow the excess oil to drain, and transfer to an ovenproof platter lined with paper towels to drain further. Keep the fritters warm in a low oven. Fry the rest of the batter in the same way, always making sure the oil is very hot before frying more fritters. When all the fritters are fried, arrange them on a platter and serve immediately. Combine the chicken stock, garlic, and saffron in a saucepan. Warm until hot, but not too hot to put your finger in. Cover, and keep warm over low heat so the saffron can infuse while you continue with the recipe. Cook and stir the diced pancetta in a cast iron skillet over medium heat until most of the fat has rendered out and the pancetta has cooked to your desired degree of doneness, about 10 minutes. Once done, remove the pancetta and set aside. Discard the grease and pour in 1 tablespoon of olive oil. Cook and stir the carrots, artichoke hearts, and green beans until the vegetables begin to soften, then remove from the pan and set aside. Heat the remaining 1 tablespoon of olive oil in the skillet, and stir in the onion. Season with salt and pepper, and cook until the onion has softened, about 10 minutes. Add the tomatoes, and cook until the tomato-onion mixture is practically a paste, 15 to 20 minutes. Spread the onion mixture evenly over the bottom of the skillet, and sprinkle evenly with the broken spaghetti pieces. Pour in enough saffron broth to cover the noodles, then arrange the pancetta and cooked vegetables over top. Add additional saffron broth as needed to cover the vegetables. Bring to a simmer, then reduce heat to medium-low, and cook until the noodles are tender, about 15 minutes. Paella and fideua are versatile dishes. In fact the original idea was to make this dish and use up leftovers, and rumor has it that paella is an old Arabic word for ‘leftovers’. Little trivia for ya! You can make paella with sausage, chicken, scallops, clams, mussels, and all sorts of veggies; ideally they work the same. If you only use vegetables, you can replace the olive oil with butter. 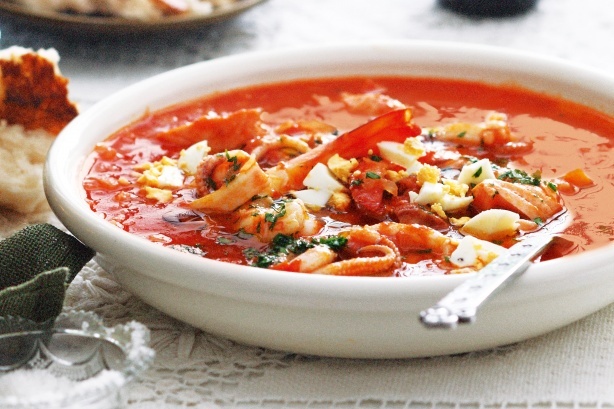 Spanish cold tomato soup which is the perfect starter to a Summer meal. Gazpacho is easy to make and although ingredients may vary according to region, this is the basic Andalusian Gazpacho recipe. Small portions of diced tomatoes, red and green peppers, cucumber, onion and bread or croutons to sprinkle on top. 1: Put the tomatoes, onion, pepper, cucumber, vinager, oil and bread into a liquidizer. If you want to dilute it, add a glass of water. Tip: if you want to go for a tangy garlic taste, add a small amount of fresh garlic to the mixture before liquidizing. 2: Put the mixture into a bowl, add salt and pepper and leave the gazpacho to chill for at least an hour. If you want to eat it straight away, you can put some ice cubes in to cool it down. Gazpacho is a Summer dish which is meant to hydrate and cool down your body. So the colder the better!! 3: Serve the gazpacho en soup bowls, with the portions of diced tomatoes, pepper, cucumber, onion, croutons etc on the table, so that everyone can add them to their bowl as they prefer. Tip: you can also sprinkle diced serrano ham or hard boiled egg. Spain produces excellent fruit, vegetables and salad foods, so try and buy good quality ones. Go to the local market instead of your nearest supermarket, where you can get the freshest (and cheapest) produce. If it isn’t Summer and you can’t get plum tomatoes, go for the ripest and juciest ones available (see our page on tomatoes, and on raf tomatoes – in Spanish). Tips/Secrets: Make sure you have enough time to put it in the fridge so that you can serve your gazpacho really chilled. Use quality produce. Vary the ingredients according to your personal taste. Gazpacho makes a delicious starter to a meal. Place the orange, apple, Cointreau and sugar in a large bowl. Cover with plastic wrap and place in the fridge for 30 minutes to chill and allow the flavours to develop. Add the sparkling shiraz, lemonade and ice cubes to the fruit mixture. Use a ladle to transfer the sangria to a jug. Pour among 8 serving glasses. Serve immediately. Allow 30 minutes chilling time. Sangria means “bleeding” in Spanish. 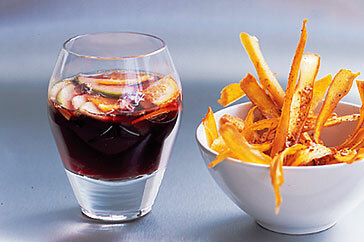 This punch-like drink gets its rich ruby colour from the addition of red wine, and uses Cointreau as the base spirit. Suquet is the diminutive form of suc, or ‘juice’, in Catalan, which means that this wonderfully flavored dish is more correctly called juicy fish stew. 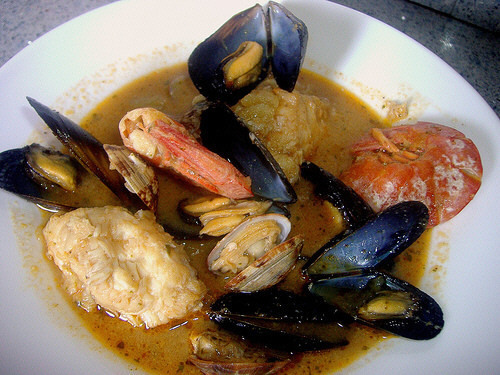 The fish and shellfish used vary from cook to cook, and so does the amount of liquid – in fact, some people call this a stew, while others call it a soup – but saffron and almonds are typically part of the mix. Scrub the clams under cold running water, discarding any that fail to close to the touch. In a large bowl, combine the clams, coarse salt, and water to cover and let stand for at least 30 minutes or up to 2 hours so that the clams release any sand trapped in their shells. Meanwhile, in a deep cazuela, heat the olive oil over high heat. Add the garlic and fry, stirring often, for about 1 minute, or until golden. Using a slotted spoon, transfer the garlic to a mortar. Reserve the oil in the cazuela off the heat. Add the almonds, parsley, and water to the mortar and pound with a pestle until a paste forms. Set aside. Return the cazuela to medium heat, add the onion, and sautÃ© for 5 minutes, or until soft. Add the tomato and saffron, mix well, and cook for 5 minutes longer to blend the flavors. Meanwhile, in a saucepan, bring the stock to a boil, then decrease the heat to maintain a gentle simmer. Add the monkfish, hake, and large and medium shrimp to the cazuela and mix well with onion and tomato. Stir in 1 cup of the hot stock and cook for 30 minutes, adding the remaining stock 1 cup at a time at 5-minute intervals. At the end of this time, all the fish wil be cooked and the flavors will be blended. Season to taste with salt. Drain the clams and add them to the cazuela along with the mussels, discarding any that fail to close to the touch, and cava. Cook for 5 minutes longer, or until the clams and mussels open. Discard any mussels or clams that failed to open. Serve immediately.